39 is a composite number. 39 = 1 x 39 or 3 x 13. 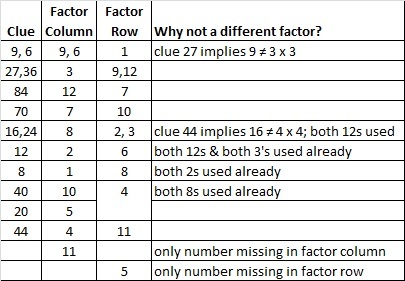 Factors of 39: 1, 3, 13, 39. Prime factorization: 39 = 3 x 13. 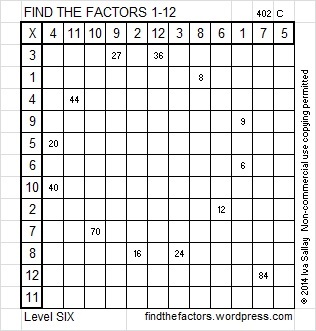 39 is never a clue in the FIND THE FACTORS 1-10 or 1-12 puzzles. Last Tuesday I published a hook-shaped level 2 puzzle and invited readers to get hooked on factoring. Today I present a level 6 hook-shaped puzzle. 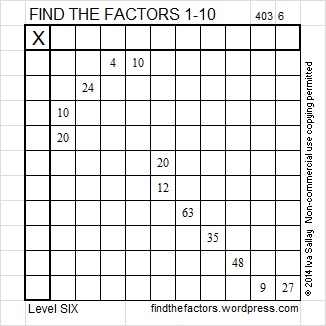 Admittedly, one would have to be seriously hooked on factoring to attempt and eventually complete the more difficult level 6 puzzle. I assure you that it can be solved using logic with absolutely no guessing and checking. This week’s puzzles are also available in an excel file here. If you have a spreadsheet program on your computer, you can access it. If you enable editing in excel, you can type your answers directly onto the puzzle, and you can also easily print the puzzles. Below is a table showing one possible way to solve the snowball puzzle using logic alone. Seriously, study the clues for this week’s puzzle and see if you can figure out how to solve it using logic alone. Guessing and checking will most likely only frustrate you. Good luck!